Another weekend arrives - so here are some tips on what's worth watching on the box between Friday and Sunday. . .
Sky Arts has been putting it up to BBC Four in terms of music docs - and now here's a real biggie. The untold story of John Lennon's album Imagine, originally released in 1971. This documentary reveals the depth of the creative collaboration between John and Yoko and explores how the art, politics and music of the pair are intrinsically entwined. 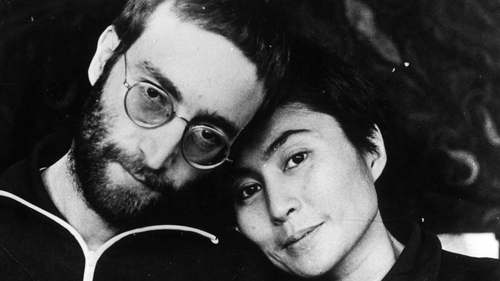 It features Yoko Ono, Julian Lennon, David Bailey, John Dunbar (the gallerist who introduced the couple), Dan Richter (Yoko's neighbour and John's former personal assistant) and Eddie Veale (studio designer), as well as never-seen-before footage of Lennon and Ono from their private archive. A TV sequel to the classic war movie, one of the most acclaimed German films ever made. Here's a German legal thriller. Defence lawyer Friedrich Kronberg knows that he must try to tip the scales of justice in favour of those he represents, no matter how culpable they appear, as he explores the grey areas between legal and moral guilt. BBC Radio 2 presenter Bob Harris introduces the best bits from country music's biggest night of the year, the 52nd annual CMA Awards from the Bridgestone Arena in Nashville. This candid biography explores the life of David Cassidy, the 70s pop idol and TV star. The film includes never-before-heard audio interviews with David from 1976, and a raw and poignantly filmed final recording session, shortly before his death. Doireann Ní Ghlacáin introduces performances recorded live at TradFest in Dublin City, including Mick O'Brien, Ciara Ní Bhriain, Mark Kelly and Séamus Begley. Suzy Klein travels deep into the world of musical theatre and the colourful landscapes of Argentina, to discover the story behind one of the West End’s most celebrated characters. Interweaving the stories of Tim Rice and Andrew Lloyd Webber’s creation with the true story of Eva Peron, she celebrates the extraordinary show in the 40th year since its creation. Emeli Sandé performs in concert at the BBC Radio Theatre in London. The multiple Brit Award-winner established herself as one of the UK’s most exciting artists in 2012, with the release of her debut album, Our Version Of Events. She also won a Brit award in 2017 for Best British Female. Her hair's pretty impressive too. Led by Brett Anderson, Suede provided glam sophistication in contrast to Oasis’s brash swagger, Blur’s cheeky mischievousness and Pulp’s perceptive wit and this film explores the defining moments in the band’s life. This is followed by Suede: Live at the Royal Albert Hall, a one-off reunion concert for charity in 2010. The Swedish police detective drama returns for a seventh season, and this time around Martin Beck investigates the murder of a restaurant owner. Louis heads to California, the US adoption capital, where the majority of new-born adoptions are carried out privately in what is now a multi-million dollar industry. Agencies, facilitators and lawyers can earn thousands of dollars per baby by matching pregnant women prepared to give up their newborns, with adoptive parents willing to pay up to $50,000 for a baby. This year's Irish representative, 14-year-old Taylor Hynes from Blanchardstown in Dublin, will sing his self-written song at the contest final in Belarus. Things are really hotting-up here in Jo Spain and Stuart Carolan’s crime drama. Convinced that Abeni knows more about Esme's death than she's letting on, Jen and her team set up a surveillance unit to find out exactly where she works. Meanwhile, Albanian gangsters arrive at the brothel to do business with Benjamin as Gar’s suspicion about Abeni increases. Can Jen find out where Abeni works and get to Flora before Benjamin and Gar know what's happening? Director George Miller does a great job with this post-apocalyptic action adventure, the fourth in the Mad Max film franchise. Charlize Theron stars alongside Tom Hardy, with Zoe Kravitz, Adelaide Clemens, and Rosie Huntington Whiteley included in the supporting cast. This is a genuinely charming film version of Michael Bond's tale of a bear who journeys from deepest Peru to become adopted by the Brown family after he's discovered at London's Paddington train station. This is well good and deserved more than just a single season run. It's based on the bestselling novels by Road to Perdition writer Max Allan Collins. Logan Marshall-Green stars as Mac Conway, a US Marine who returns home to Memphis in 1972 after fighting in Vietnam. Finding himself shunned by those he loves and demonised by the public, he becomes drawn to a murky criminal underworld, filled with money, violence and contract killing.